Fastest ever recovery! 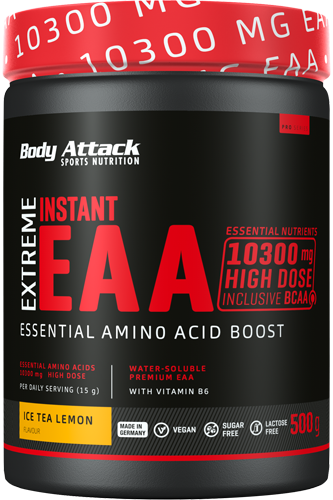 Use Body Attack Extreme Instant EAA to shift gears towards muscle mass growth and maintenance. During the muscle growth or diet phase, EAAs supply your body with essential growth nutrients. The ultrafine Extreme Instant EAA powder includes all 8 important essential amino acids. Especially during the regeneration phase, they support the repair and growth of the muscle tissue. The three BCAAs, i.e. Leucin, Isoleucin and Valin plus Vitamin B6 which is important for the metabolism, round off Extreme Instant EAA. Recover faster before your next workout and never again lose hard-gained muscles! For whom is Extreme Instant EAA recommended? Intensive workout phases require your body to perform extreme metabolic activities. During these peak phases, your body will have an increased demand for vitamins, which you must be sure to meet. The Vitamin B6 contained in Extreme Instant EAA, supports a normal energy metabolism and reduces the feeling of tiredness and fatigue. Furthermore, Vitamin B6 is essential for the new production of muscle proteins and contributes to the regulation of hormonal activities. In particular in strength and endurance sports, your metabolism will be significantly increased during exercise so that an additional intake of Vitamin B6 will have a supporting effect. The earlier the EAAs are made available to the protein and energy metabolism, the faster and more effective the growth and recovery process of the muscles. Do you often go without breakfast? Then you should try an EAA drink directly after getting up. During workout, our muscles must deliver a considerable strength and endurance performance over a short time. For this reason, an EAA drink before, during and after workout can be a good supplement to your diet. If you are on a low-protein diet with only a few animal-based foods, your body may suffer from a limited intake of essential amino acids. To prevent this, we recommend to supplement your diet. Body Attack Extreme Instant EAA is produced on the basis of raw vegetable ingredients and is therefore suitable for vegetarians and vegans.